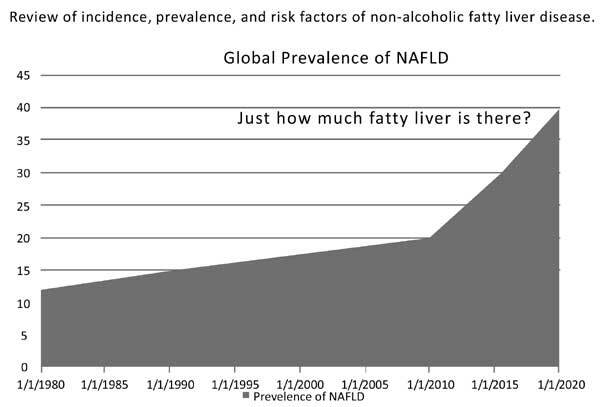 First described in 1980, nonalcoholic fatty liver disease (NAFLD) has become more common although the exact incidence and prevalence is unknown. While the exact prevalence varies from region to region, the overall trend shows an increased number of patients with NAFLD. Risk factors for the development of NAFLD includes advanced age, male gender, obesity, and having elements of the metabolic syndrome. There is also an association between the presence of NAFLD and coronary atherosclerosis. Persons of Hispanic descent tend to have higher rates of NAFLD when compared with other populations. Genetics, specifically polymorphisms in the gene PNPLA3, may explain the difference among these different groups. As the rates of obesity increases throughout the world, it is anticipated that the rate of NAFLD will continue to increase. This has large scale implications on the rates of cirrhosis, hepatocellular carcinoma, liver transplantation and cardiovascular events that could impact hundreds of millions of people. Keywords: NAFLD, NASH, prevalence, obesity, metabolic syndrome, steatosis. Keywords:NAFLD, NASH, prevalence, obesity, metabolic syndrome, steatosis. Abstract:First described in 1980, nonalcoholic fatty liver disease (NAFLD) has become more common although the exact incidence and prevalence is unknown. While the exact prevalence varies from region to region, the overall trend shows an increased number of patients with NAFLD. Risk factors for the development of NAFLD includes advanced age, male gender, obesity, and having elements of the metabolic syndrome. There is also an association between the presence of NAFLD and coronary atherosclerosis. Persons of Hispanic descent tend to have higher rates of NAFLD when compared with other populations. Genetics, specifically polymorphisms in the gene PNPLA3, may explain the difference among these different groups. As the rates of obesity increases throughout the world, it is anticipated that the rate of NAFLD will continue to increase. This has large scale implications on the rates of cirrhosis, hepatocellular carcinoma, liver transplantation and cardiovascular events that could impact hundreds of millions of people. AMPA Receptor Antagonists with Additional Mechanisms of Action: New Opportunities for Neuroprotective Drugs? Hyperuricemia: Is it a Risk Factor for Vascular Endothelial Dysfunction and Associated Cardiovascular Disorders?